New in store this month is the 3G ‘Hands in’ Hygiene Hand dryer. We are very happy to have such a quality product in our range of high speed hand dryers. Take a look at the full product spec on the Stream Hygiene Hand Dryer page. To look at the 3G dryer is one of the most distinctive ‘hands in’ hand dryers around. It has been designed with the compact washroom in mind with a thin body and a large easy access opening to provide users with full high powered hand drying satisfaction. The design means that children and wheelchair users are easily able to dry their hands with out struggle. It is made in Europe from stainless aluminium. We think the overall style of the dryer is perfect for corporate wash rooms, public amenities, and leisure businesses. The 3G dryer comes in four colour variations (white, silver, carbon fibre and leather look) so whatever your washroom needs the 3G dryer is suitable for any environment. The 3G hand dryer boasts various other features including an easy to empty drip tray which allows the washroom attendant to change the water collection tray quickly and without fuss meaning the dryer down time is reduced significantly. Great for busy wash rooms! The 3G dryer is also treated with anti-bacterial surface protection which means the unit is safe to touch and use. 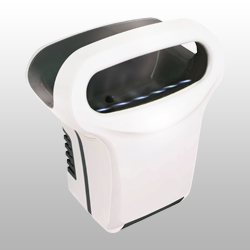 We think its a great little hand dryer with plenty of power and a great design. To find out more about this product and more, check out the Stream Hygiene page or give our friendly sales team a ring on 0845 370 0030. Previous Post Surfaces and Bacteria: Which ones to watch out for! Next Post Avoid flu over the Christmas Holidays.